Recent advancements in the field of nano-technology focused attention on developing materials with new and useful characteristics. In particular, there is interest in designing nanocomposite thermites for self-propagating high-temperature synthesis (SHS) applications. The composite material consists of nano-scale particles that are in nearly atomic scale proximity but constrained from reaction until triggered. Once initiated, the reaction will become self-sustaining and a new intermetallic alloy product will be produced1. These materials consist of a mixture containing nano-scale metals, metal oxides, and/or organic and inorganic polymer binders and are being used for overlapping technologies ranging from materials synthesis1 to local energy generation applications2. For example, when a reactant mixture is ignited to produce a new material, the combustion synthesized product can be useful as a biomaterial3 or the reactants can be tailored to synthesize corrosion resistant high temperature metallic alloys4. When the reaction is significantly exothermic and results in rapid flame propagation, the reactant mixture can be tailored to generate energy for industrial, civil or military applications5. This short article is focused on examples of future opportunities within nanostructured metallic alloys, but there is a relatively large literature base reporting on observations of unique behaviors of nano versus micron (traditional size) particles1-15. 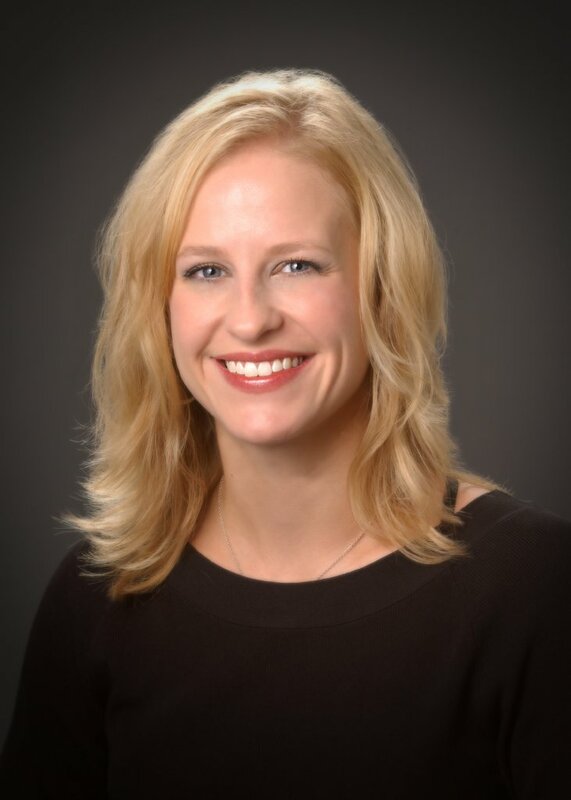 While some of the fundamentally unique observations specific to nanoparticles are just now being realized, these developments can be exploited to help researchers address current critical issues such as energy generation applications, biomaterials for bone implants and skeletal repair, and the spread and transfer of infectious bacteria and molds. When individual fuel and oxidizer particles approach nanometer dimensions, nanoparticle thermal and combustion behaviors are unique in that the energy required to initiate a reaction can actually be stored and build-up within the particles. These energy storage formulations consist of fuel metal nanoparticles combined with metals or metallic oxide nanoparticles and are referred to as Nanochargers16. The Nanocharger stores energy as the particles are held in an inert state, and when triggered, the slow gasless reaction that occurs is controlled by mass transport and energy required to diffuse reactants toward each other. Ignition leads to a slow controlled, self propagating, high temperature conversion of chemical energy to thermal energy. The unique thermal, mechanochemical and combustion properties for nanoparticles are the foundation for this innovative concept: use nanoparticle fuel and oxidizer composites as reactants in a Nanocharger that will store and deliver energy on demand. Figure 1 shows time stamped still-frame images from the IR camera indicating the nanometric sample stored energy 46 seconds longer than the micron-composite material. 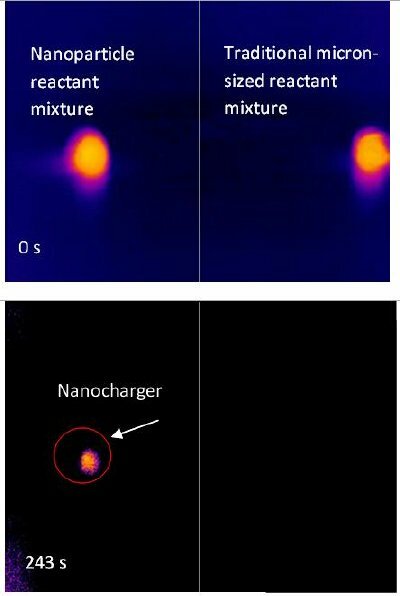 Nanochargers could be described as a cross between a battery and molten salts. The reactants achieve similar thermal inertia properties of molten salts (enabling storage), but energy delivery is based on a chemical reaction, more similar to a battery. Storing thermal energy for extended periods may be useful for some forms of renewable energy, such as solar thermal. In this way, heat energy stored within the Nanocharger during the day could be easily delivered during evening hours, when the sun does not shine16. Figure 1: Infrared thermal images time stamped for nanometric particulate mixtures and micrometer particulate mixtures composed of Al/Mn. (adapted from ). In the field of combustion synthesis, much work has been done to generate porosity by adding blowing agents to the reactant matrix and Moore et al. provide a review of much of this literature17-18. A foam-type product can be created when a mildly energetic composite includes a modest amount of gasifying agent (GA). During a reaction the gasifying agent generates nucleation sites that promote the formation of bubbles. As the reaction wave passes, the gas pockets within the bubbles escape leaving a porous structure. In previous combustion synthesis studies, a gasifying agent may be added as a separate reactant and usually in the form of a powder or granular material19. This strategy was shown to be highly successful for synthesizing ceramic materials for biological applications15. However, incorporating blowing agents to synthesis metal alloys has not been widely pursued yet has recently been shown to be feasible using nanoparticles15. Control over properties of the final product, such as porosity, can be achieved by tailoring reactant composition. In 2006, combustion synthesis was used to form porous nickel aluminide and showed that the porosity of the final product is a function of the percentage of gasifying agent present in the reactant matrix15. Today, this work is extended to understand the mechanics of synthesizing a porous titanium aluminide (AlTi) alloy in order to create an axially graded porosity distribution. Metallic foams are synthesized by means of a self propagating high-temperature reaction producing a highly porous solid metal alloy with customizable material properties. Nano-scale aluminum and nano-scale titanium particles are mixed with either nano-scale aluminum passivated with a gasifying agent such as perfluoroalkyl carboxylic acid (C13F27COOH) or polytetrafluoroethylene (Teflon) (C2F4) particles. When pressed into pellets and ignited with a laser, they produce a reaction product composed of an AlTi alloy that has a highly porous structure. In this way, combustion synthesis can be used to create a functionally graded porous AlTi alloy and identify correlations between the product microstructure and parameters such as type and amount of gasifying agent present in the reactants. Photographic data allow interpretation of the reaction propagation while characterization of the final product indicated porosity and morphology. These nanostructured metallic alloys may have applications in biomaterial development by tailoring porosity throughout the matrix. 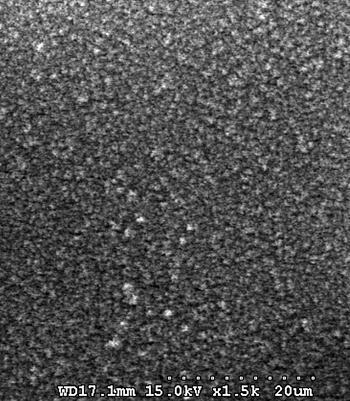 Figure 2 show a scanning electron micrograph (SEM) of this AlTi alloy. Bacterial contamination in hospitals, food industries, and public environments create a major public health issue. Despite considerable research and development efforts, the problem of contaminations related to biomedical devices and food preparation persists. Traditional cleaning methods, such as aerosolized disinfectant sprays or wipes have a limited effectiveness. There is a strong need to mitigate bacterial colonization by engendering materials with properties that include surface chemistry20-22 and surface roughness23-25 which are unfavorable for bacterial attachment and growth. Silver has been used for years in many bactericidal applications because of its strong toxicity to a wide range of micro-organisms20-27. Research has shown that the bactericidal properties of silver are size dependent, and only nanoparticles present a direct interaction with the bacteria22. Titanium dioxide (TiO2) has also become a popular agent for bacterial neutralization. Several commercial products have been developed that incorporate nanoparticles of TiO2 for antibacterial applications28. Highly porous, antibacterial solid metallic alloys (or foams) can be created through combustion synthesis. By combining nano-scale Silver Oxide (Ag2O) or TiO2 particles with Aluminum (Al) nano-scale particles, the reaction can produce a self-propagating heat wave that will synthesize metallic foams made of pores only nanometers wide that inherently exhibit antibacterial properties. The extraordinarily high surface areas these foams possess serve as an excellent platform for the neutralization of bacteria. These newly synthesized alloys present a novel approach to bacterial neutralization. 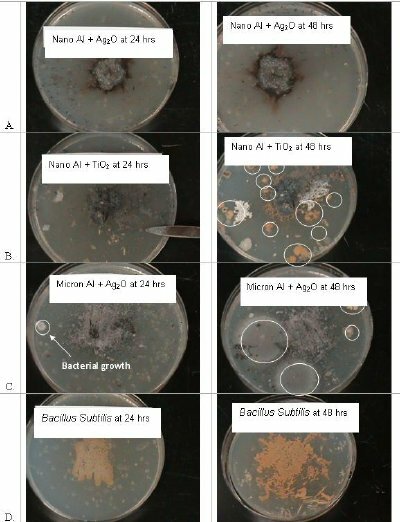 Figure 3 shows nanostructured metallic alloys undergoing bacterial growth tests at 24 and 48 hours. . The bacterial growth is highlighted with a white circle. Figure 3D shows a control sample before and after exposure. Five important conclusions can be drawn from these results. Combustion synthesis can be used to create nanostructured metallic alloys that have antibacterial properties. Bacteria growth kinetics are a function of reactant particle size. Nanoscale reactants are more effective in neutralizing bacteria. metallic nanofoams composed of nano-scale Al and Ag2O prevent growth of bacteria. These nanostructured metallic alloys can be easily created as a structural material or a metallic coating through combustion synthesis and have far-reaching applications in the renewable energy, food service and medical industry. Nanostructured metallic alloys truly are the material of the future. 1. Varma, A., "Form From Fire", Scientific American, pp. 58-61, August (2000). 2. J. Giles, Nature, 427, 580-581 (2004). 3. R.A. Ayers, D. Burkes, G. Gottol, Journal of Biomedical Materials A, 81A (3), 634-643 (2008). 4. Tomasi, R. and Munir, Z. A., "Effect of Particle Size on the Reaction Wave Propagation in the Combustion Synthesis of Al2O3-ZrO2-Nb Composites," J. Am. Ceram Soc. v. 82, n. 8, pp. 1985-1992 (1999). 5. "Combustion Velocities and Propagation Mechanisms of Meta-stable Intermolecular Composites," B. S. Bockmon, M. L. Pantoya, S. F. Son, B. W. Asay, J. T. Mang, Journal of Applied Physics 98(6), 064903 (2005) [DOI: 10.1063/1.2058175]. 6. "Combustion Behaviors of Highly Energetic Thermites: Nano versus Micron Composites," M. L. Pantoya and J. J. Granier, Propellants, Explosives, Pyrotechnics 30(1), 53-62 (2005) [DOI: 10.1002/200400085]. 7. Dreizin, E.L., Metal-based reactive nanomaterials, Progress in Energy and Combustion Science 35; 141-167 (2009). 9. Rossi, C., Zhang, K., Esteve, D., Alphonse, P., Tailhades, P., Vahlas, C., Nanoenergetic Materials for MEMS: A Review, Journal of Microelectromechanical Systems 16(4), Aug 2007 919-931. 11. E. M. Hunt and M. L. Pantoya, Nanostructured Metallic Alloys: Synthesis, Properties and Applications, ISBN: 978-3-8364-3438-6, VDM Verlag Dr. Muller publisher 2007. 12. E. M. Hunt, J. J. Granier, K. B. Plantier and M. L. Pantoya, "Nickel Aluminum Superalloys Created by the Self-propagating High-temperature Synthesis (SHS) of Nano-particle Reactants," Journal of Materials Research 19(10), 3028-3036 (2004). 13. E. Hunt, K. Plantier, M. Pantoya, "Nano-scale Reactants in the Self-Propagating High-Temperature Synthesis of Nickel Aluminide," Acta Materialia 52(11), 3183-3191 (2004). 15. E. M. Hunt, M. L. Pantoya and R. J. Jouet, "Combustion Synthesis of Metallic Foams from Nanocomposite Reactants," Intermetallics 14 (6), 620-629 (2006). 16. Hunt E.M. and Pantoya M.L. "Nanochargers: Energetic Materials for Energy Storage," Applied Physics Letters, 95 (25), (2010). 17. Moore JJ, Fend HJ (1995) Combustion synthesis of advanced materials: Part I. reaction parameters. Progress in Materials Science 39, 243-273. 18. Ayers RA, Burkes DE, Gottoli G, Yi HC, Zhim F, Yahia LH, Moore JJ, Combustion synthesis of porous biomaterials. Journal of Biomedical Materials Research Part A 81(3), 634-643. 19. Vasilev K., Cook J., and Griesser H., "Antibacterial surfaces for biomedical devices," Expert Review of Medical Devices: 6, (5), 553-567; (2009). 20. Trapalis C., Kokkoris M., Perdikakis G., and Kordas, G., "Study of Antibacterial Composite Cu/SiO2 Thin Coatings," Journal of Sol-Gel Science and Technology," 26, 1213-1218, (2003). 21. Morones J.R., Elechiguerra J.L., Camacho A., Holt K., Kouri J.B., Ramirez J.T., Yacaman J., The bactericidal effect of silver nanoparticles, Nanotechnology 16: 2346-2353 (1998). 22. Zhao G., Stevens E., Multiple parameters for the comprehensive evaluation of the susceptibility of Escherichia coli to the silver ion, Biometals 11: 27-32 (1998). 23. Faille, C. et al. "Adhesion of Bacillus Spores and Escherichia coli Cells to Inert Surfaces: Role of Surface Hydrophobicity." Canadian Journal of Microbiology 48; 2002. 24. Kenar, L. et al. "Comparative Sporicidal Effects of Disinfectants after Release of a Biological Agent." Military Science 172(6) 2007. 25. Whitney, E. et al. "Inactivation of Bacillus anthracis Spores." Emerging Infectious Diseases 9(6); 2003. 26. Taylor P.L., Ussher A.L., Burrell R.E., Impact of heat on nanocrystalline silver dressings Part I: chemical and biological properties, Biomaterials 26: 7221-7229 (2005). 27. Fujishima A., OhkoY., Saitoh S., Tatsuma T., Niwa C., and Kubota Y., "Antibacterial and Anticorrosion Effects of Titanium Dioxide Photoactive Coatings,"
28. Whitney, E. et al. "Inactivation of Bacillus anthracis Spores." Emerging Infectious Diseases 9(6); 2003. 29. Kistler S.S., Coherent expanded aerogels in jellies, Nature 127: 741 (1931).